For many families shopping and Thanksgiving are synonymous. After enjoying a large, home cooked meal and maybe a football game or two on the TV, many find themselves browsing through that morning’s newspaper with its stacks of coupons, advertisements, and Black Friday savings announcements. Once great gift ideas have been identified, brave shoppers venture out into the evening to either wait in line or wade through the multitudes looking for the best doorbuster deals. For those who will be enjoying one of our Lincoln City vacation homes this Thanksgiving, we thought it would be helpful to point out some great locations to shop and find that perfect gift. The Lincoln City Outlets offer shoppers a wide variety of retailers including Nike, Coach, Eddie Bauer and much, much more. The complex is open air with plenty of covered walkways to keep shoppers dry any time of year. This Thanksgiving the outlets will be open from 6 pm to midnight with special sales, rewards, and prizes. Located along Highway 101, and not far from our Pacific Winds condos, the Christmas Cottage offers shoppers over 25,000 different ornaments from around the world. 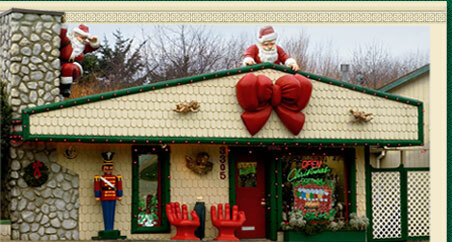 The shop also includes specialty items including German nutcrackers, Santa figures, cards, and stationery. No matter what your interests may be, their friendly staff can help you find just the right gift for that special person. Located in the community of Gleneden Beach, these boutique shops include handicrafts from local artisans, fine wines from renowned vineyards, unique hand-blown glass, sculptures, and paintings. A must visit for those looking to surprises a loved one with something one-of-a-kind. Known for their top quality kites, tails, wind décor and banners, Norwest Winds and Kites is a must stop location, especially if you have visited Lincoln City during the semi-annual kite festival. The shop also builds show kites and offers flying lessons. Known as the largest antique mall on the Oregon Coast, shoppers will find primitives, furniture, pottery and gourmet coffee to taste. While browsing the many goods for sale, one can find items that conjure up memories of a wonderful family outing or favorite book or comic strip. Whether looking for a vintage dress or imagining a century-old hat hanging in the front room, you will enjoy the adventure of antique shopping in Lincoln City. Since 1997, Finders Keepers has drawn tens of thousands of tourist to the beaches of Lincoln City in a quest to find glass floats hidden along the 7-1/2 miles of beach stretching from Siletz Bay to the Roads End area. These glass floats were created by local and national artists and are individually numbered and signed. During the Thanksgiving holiday, a special glass drop of 100 art pieces is set to occur starting November 27th. Guest staying in our Lincoln City vacation condos are ideally located near one of the convenient beach access points where the search for one of these brilliantly-colored glass floats can begin. Some of the best spots to search are north of the access point towards Cascade Head. Hand-crafted floats can be found between the tide line and the beach embankment. Floats are often hidden behind or inside driftwood or in between the long shafts of brush grass that line the embankment. Floats will never be found in or on the cliffs. Whether or not you are able to find a glass float, the fun, and excitement of searching for and potentially finding one of these unique pieces of art has quickly become a tradition for many who visit the Oregon Coast and Lincoln City during the Thanksgiving holiday. For many, Thanksgiving is not just a day in the 365 that make up the calendar year. It is instead the start of a wonderful, and often busy, holiday season that ends with the ringing in of a New Year. Along the Oregon Coast, many families and friends have started the tradition of celebrating Thanksgiving with not only the iconic family dinner and subsequent football game on TV but also with beautiful views of a sunset over the water and long walks along Lincoln City’s seven miles of beach. Over the next couple of weeks, we are going to post ideas and suggestions of things to do and see that may one day become your family’s Thanksgiving tradition and the beginning to a memorable holiday season.